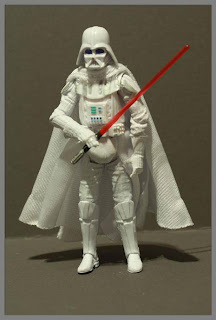 Don't adjust your eyes or your monitor...Darth Vader really is white, and this isn't some crazed fans action figure modification! I saw this Darth Vader in my local Target, did a lap around the store, came back to buy it, and it was GONE! I was not happy. Not sure why I didn't pick it up in the first place but I figured I would never see another one for sale (in a store) again. So, I went home to do a little research and found out this is part of the Star Wars Infinities series where alternate plots occur such as Leia joining the Dark Side and as you see here, Darth Vader joining the Light Side and dawning a bleached costume. "On the Death Star, Palpatine orders Vader to kill Leia. Luke unleashes his lightsaber and duels with Vader himself. Leia attempts to intervene, but is subdued by Force Lightning from the Emperor, allowing Luke and Vader's duel to continue. Han, despite his blindness, takes Chewbacca's place in the Falcon’s gunner turret after Chewbacca is injured. The Falcon flies down to Endor and destroys the shield generator, allowing the Rebel fleet in space to enter the half-completed Death Star. Lando takes the Falcon back to the Death Star to rescue Luke and Leia. Luke continues to duel Vader, revealing to him that both he and Leia are his children. Vader is stunned by the revelation, but strikes down Luke at the cost of one of his arms. However, Vader is unable to kill his own children and surrenders, causing him to turn from the dark side of the Force. During the duel, the Emperor escapes and Luke and Leia carry the wounded Vader to the Falcon waiting in the docking bay and escape before the Death Star explodes. Sometime later, on the Rebel flagship, Mon Mothma informs Luke that the Emperor is alive and still a threat. Anakin, now clad in a white variation of the suit he wore as Vader, agrees to help the Rebels track down Palpatine." I much prefer the thought of a nice Vader myself. But I suppose that is because I am a woman and mother of young children. Nice is good. Keith Parkinson - "Master of Fantasy Art"